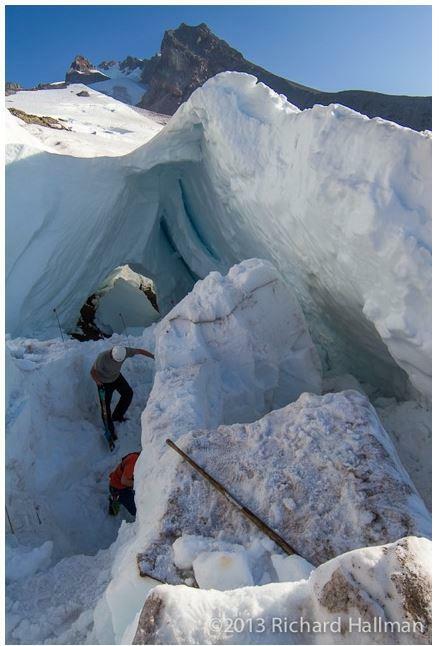 On Saturday, August 3, 2013, a group of six or seven snowboarders from Timberline Ski Area were exploring an ice cave or overhung crevasse on White River Glacier at about 8100’. White River Glacier is located to the northeast of the Timberline Ski Area boundary. While they were in a sort of tunnel in the ice, overhanging snow collapsed, burying or partially burying three of the boarders. According to news accounts, two of boarders were extracted with help from the others, but one member of the party was not located and was believed to be buried deep in the ice. Around 4:00 p.m. on August 3, the Clackamas County Sheriff’s Office contacted Portland Mountain Rescue to request assistance in locating and rescuing an avalanche victim on the White River Glacier. Two PMR rescuers joined a team of Crag Rats at the scene. They determined that the accident was the result of a collapsing serac, not an avalanche. They secured the scene for safety by cutting back portions of the remaining overhang and developed a plan for excavating the area the following morning. They estimated that they would have to excavate 10 to 15 feet of ice to reach the victim. On Saturday, August 4, 2013, a team of five PMR rescuers joined a team of seven Crag Rats who lead the mission. The joint team departed Timberline Lodge around 5:00 a.m. and reached the scene a little before 6:00 a.m. Using chain saws, they cut blocks of ice which were removed by hand using a bucket brigade technique. The victim was located around 9:30 a.m. The team packaged the body in a portable litter and hauled the body a short distance over difficult terrain. At times, they used a rope system to raise or lower the package. When they reached the ski area, the package was transferred to the Timberline Ski Patrol who moved it down the mountain and delivered it to the medical examiner at Timberline Lodge. Our rescuers are saddened by this accident and we offer our condolences to the victim’s family and friends. 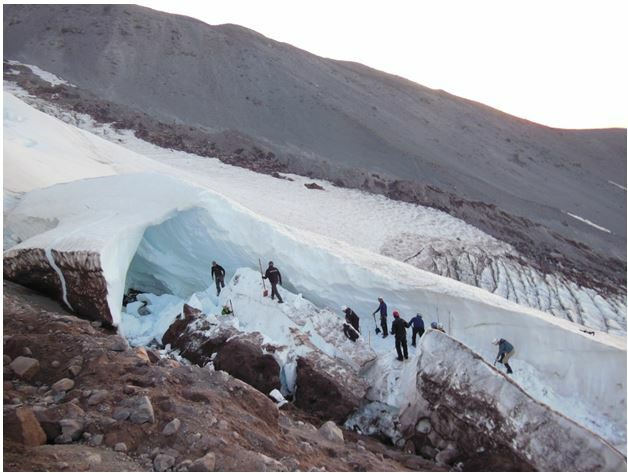 This accident is a reminder that glaciers, and the Cascade Mountains generally, are a dynamic environment where ice and rock can move at any time. PMR encourages back country travelers to obtain appropriate training on safe glacier travel before venturing into glacial terrain. Scene on Sunday morning before excavation commenced. In an EMERGENCY immediately call 911 After you hang up, save your cell phone battery and keep your phone available for further contact with rescue personnel. The PMR logo is a Servicemark of Portland Mountain Rescue. The Mountain Rescue logo is a Trademark of the Mountain Rescue Association and is used here with permission. Photographs courtesy of Matt Weaver. Copyright © 2019 · Portland Mountain Rescue. All rights reserved.